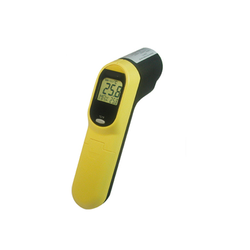 Pioneers in the industry, we offer industrial infrared thermometer from India. The Industrial Infrared Thermometer that we present have been made under the professional guidance of superiors who have immense credentials in this field. We adhere to all the criteria in order to meet the specific needs of the client. The prices set by us are nominal and reasonable. Quality that we preach is impressive and durable. Examining the products for their functional purpose is followed religiously. Looking for Industrial Thermometer ?